This letter is in reference to Ms. Rebecca Kemble and Ms. Nicole Desautels Schulte who both have press passes for The Progressive. On Friday, March 30 around 10:30 AM, Ms. Kemble and Ms. Desautels Schulte came into Senator Fitzgerald’s office with three other protesters, including one who has been dragged out of the Senate Gallery by police because he didn’t follow Senate Gallery rules. At least three of these individuals were holding cameras and video-recorders, including Ms. Desautels Schulte. These individuals came to our office to ask whether or not Senator Fitzgerald was in, and what his thoughts were on having his recall election certified. This entire interaction was taped, with my co-worker Cindy Block and I both being recorded. When they learned Senator Fitzgerald was not available, and I attempted to procure a phone number where they would be able to receive a response to their political question [sic]. One of the individuals began to speak loudly to me, in a way that I found intimidating and unnecessary. I find it incredibly uncomfortable and unsettling that two individuals who have press passes authorized by the Wisconsin Capitol Correspondents Association believe it to be ethical to associate with protesters when they go door-to-door in the Capital [sic], harassing public workers, and refusing to go through the appropriate and well-known channels of receiving a comment from an elected official. Please consider my testimony when weighing whether to issue or revoke press credentials to individuals who I believe are breaking an ethical code that should be upheld by members of the media. If you have further questions, you may contact me via phone at (608) 266-5660. The Wisconsin Republicans view any challenge to their authority and personal dignity as a legal and moral crime that must be stopped. In the past year this has included having people arrested for wiggling their fingers, holding a variety of innocuous pictures, daring to ask questions of legislative staff, or for nothing at all. No member of the WI Legislature is more prone to this self-serving schizophrenia than Seeman’s boss, Scott Fitzgerald, a man who has publicly bragged about being a bully (fellow GOP senator Mike Ellis called him a “grifter”), but who regularly throws tantrums of self-pity when things don’t go his way. Given her work environment, it is not surprising that Seeman has picked up some bad habits. But none of this is the real story here. Abuse of power by the Wisconsin GOP has become such a regular occurrence over the past year that Seeman’s letter hardly stands out. No, the real story is to whom the letter is addressed: Why would Seeman believe that it is appropriate to complain to the official press organization in the Capitol about reporters associating with “protesters” and not going through appropriate channels to get comments from legislators? And Seeman is not simply complaining. 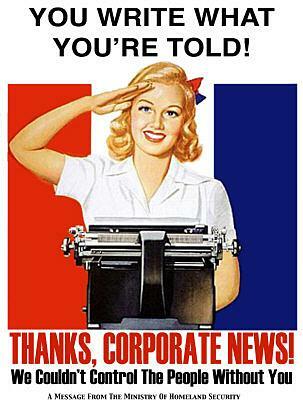 She is looking for retaliation, for the revocation of Rebecca Kemble and Nicole Desautels Schulte’s press credentials. Seeman clearly believes that her arguments against Kemble and Desautels Schulte—her claims that they engaged in “unethical” behavior—will carry weight with Stein. The question is, why? Part of the reason is the strange relationship that exists between the WCCA and the Legislature, discussed in more detail in an earlier WCMC report. Briefly, the Capitol press corps is not what many people imagine a press corps is and should be—a fully independent observer and watchdog of the legislative process. Rather, the WCCA operates under authority granted to it by the Legislature. The WCCA is, in effect, a branch of the Legislature. 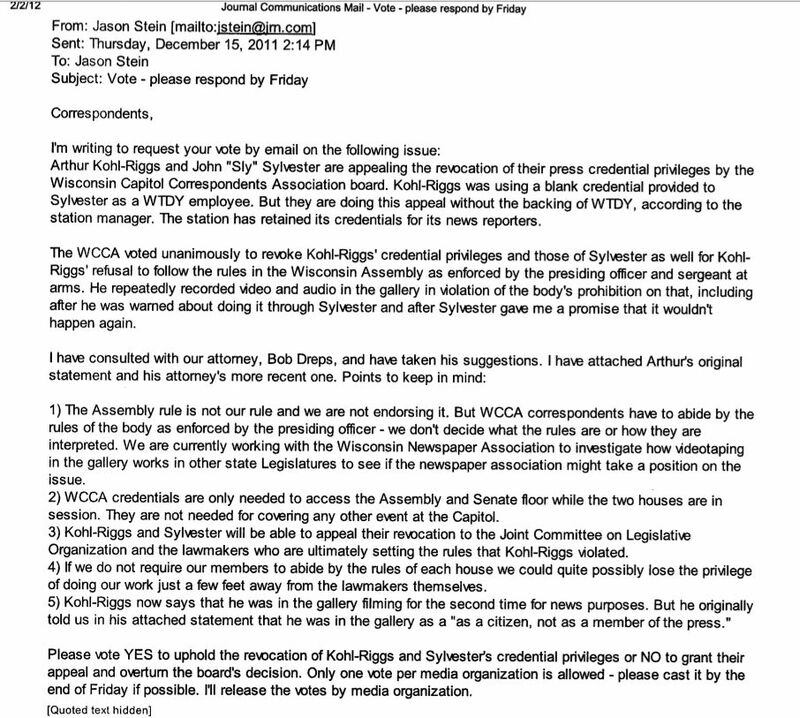 As revealed in internal emails (such as those shown below), WCCA reporters view their access to legislators as a privilege that they live in fear of being revoked. Seeman’s letter plays on this fear, implying the possibility of retaliation against the press if her complaints about Kemble and Desautels Schulte are not addressed. It is a measure of how subservient the press is to the Legislature that a low-level staffer takes for granted her power to intimidate the head of the Capitol press corps. There is more in the letter than intimidation, however. Behind the threat there is an assumption of common language and attitudes. Seeman does not bother to explain why “to associate with protesters” is such a bad thing for a WCCA-credentialed journalist. She takes it for granted that Stein knows and concurs with her concerns. Despite its aggressive tone, Seeman ultimately appeals to Stein’s sympathy as a fellow sufferer of the annoying intrusion of protesters into the quiet, rule-bound order of the pre-protest Capitol. Prior to the protests, the Capitol was a political backwater from which ambitious reporters hoped to graduate to more important beats, and to which mediocre reporters were banished. Wisconsin political news was a subject that interested very few people in Wisconsin, much less the rest of the country. Even events like the Caucus scandal generated barely a ripple of interest nationally. Culturally and intellectually, the Capitol resembled a high school without teachers, with politicians as athletes, legislative staff as cheerleaders, and reporters as student newspaper and yearbook editors. 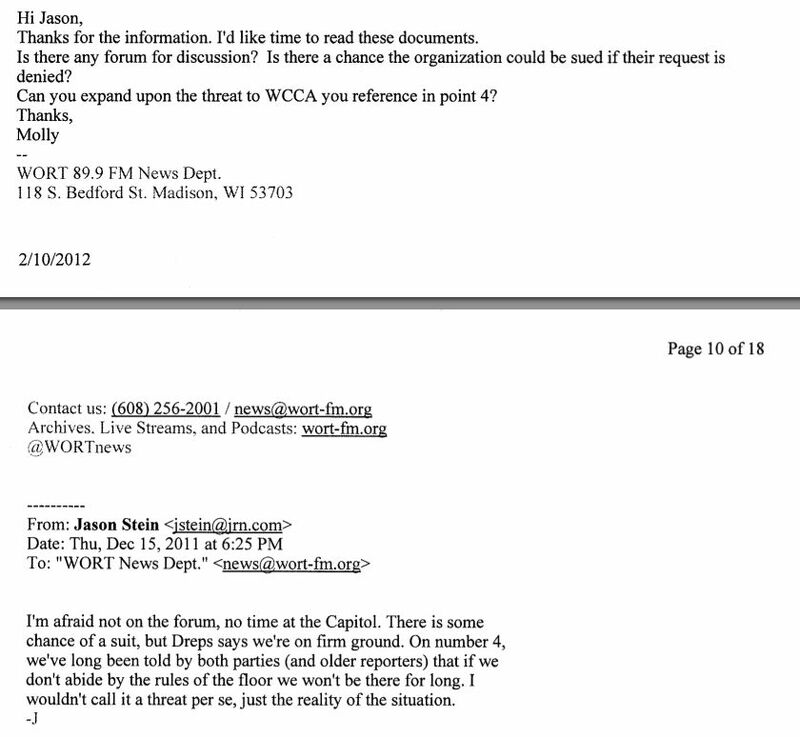 An email exchange between WCCA president Jason Stein and WORT News, in which Stein explains his fear of retaliation if he does not enforce legislative “rules.” Stein also reveals in inability to understand that someone can be a “citizen” and a reporter at the same time. Nestled in their second-floor office, Capitol reporters could believe that this comfortable place of established rules and social hierarchies was the real world, and that what they had to say about it was important. But they were not prepared for what happened in February of 2011 and later, when events of actual importance erupted on their small stage. November 19, 2011, Madison Wisconsin, Capitol. Protesters create a “flying pig” to celebrate the official opening day of the Scott Walker Recall. Reporters have seen protests before, of course, but protests of the genteel sort with permits and programs and fixed start and end times. The Capitol protests follow no such rules and prove to be altogether beyond the ability of the Capitol press corps to comprehend. Pulitzer-Prize nominations notwithstanding, one of the peculiarities of the Wisconsin protests has been the complete failure of the local press, including liberal darlings like WPR and Isthmus, to produce any interesting coverage of them. This failure is not rooted in political bias but in the confusion and frustration that unimaginative and rule-driven people feel when confronted by something outside of their experience. Capitol reporters, legislative staff like Seeman, and many of the legislators themselves simply cannot accept the legitimacy of this loud and disorderly brand of politics, and resent its intrusion into their well-ordered lives. Leaving the real work of narrating the Wisconsin uprising to an assortment of bloggers, videographers and other “citizen journalists,” the Capitol press has responded to recent events by closing ranks with legislators and their staff, dismissing the protests and demonizing the protesters. “Protester” has become a term of contempt, a word that describes interlopers who violate the customs of Capitol High School, and exercise political power without regard to decorum, dignity or dress codes. This is how Seeman uses, and Stein understands, the word ‘protester’ in her letter. Seeman is like a groupie of the football captain warning the yearbook staff that they’d better stop hanging around with “those people” if they want to be invited to the cool parties. But the “protester” has become a major player in Wisconsin politics. While the persistence of the protests baffles and irritates reporters because it does not obey the narrative trajectory such things “should” obey, it diagnoses a political conflict that is far more deeply rooted than the shallow debates over policy that political reporters are accustomed to cover. Scott Walker and his policies have awakened the kind of passionate revulsion that drives revolutions, and that “normal” politics never will mend. The heart and future of Wisconsin politics, perhaps national politics, is not among the career-conscious interns in legislative offices eagerly working their way up the political ladder, but in the rabble chanting in the rotunda, shouting from the legislative galleries, and being dragged away by police. It is in the nature of the dreary people who become political reporters not to recognize such things. But if history is any guide, there are among the indecorous and shabbily-dressed protesters people who will have far more effect on the world than any of the star athletes of Capitol High. Such people are the actors in history, while the Fitzgeralds and Walkers are just the props. While Capitol reporters fret about loss of privileged access to small-time politicos, they have squandered the privilege of witnessing at close range what may well be the most important—perhaps the only important—event in their careers.